Site-specific installation of bibliographic research materials (library books, personal books, other texts), vintage wooden drawing table, chairs. 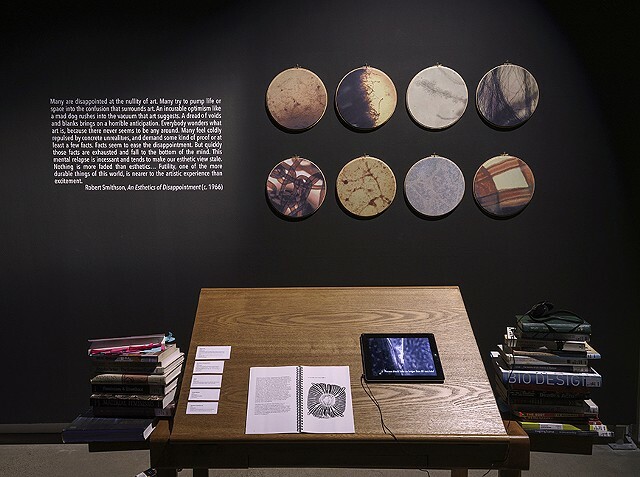 Includes Aseptic Requiem on iPad and artist book, Biomateria; Biotextile Craft. Bibliographic is a research station offered to gallery visitors for consideration, perusal and personal use. Bibliographic emphasizes the role of research in the process of research-creation, not just through hands on making but including rigorous academic bibliographical research. In this way, the role of reading and writing is positioned as central to the understanding of the art conception and production, while offering the process as an interactive and collaborative method (I borrow ideas).